Well-designed e-commerce website navigation leads shoppers straight to the items they want. The shorter the time they are browsing, the faster they will buy. You don’t want your visitors to fall into even a second of frustration, or they could be lost. Want more sales? 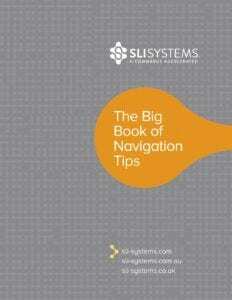 Grab your copy of the Big Book of Navigation Tips. Power Tip: Apply top search terms to your category and subcategory pages to help shoppers navigate to exactly what they had in mind.